In the game, players take control of one or more Colonial and Cylon ships and face each other in furious dogfights and many other different kinds of missions. The game features innovative mechanisms allowing players to simulate space combat using simple and intuitive rules to imitate the unique dynamics of the battles in the TV show. 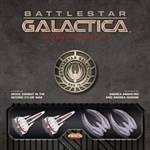 Battlestar Galactica: Starship Battles includes both "Classical and "Reimagined" settings as the publisher's license with Universal Brand Development includes both the classic series, created by Glen A. Larson in the late 1970s, and the re-imagined series developed by Ronald D. Moore and David Eick, which aired until 2010.